The Elmhurst Park District holds its annual Santa’s Workshop at Wilder Mansion on Saturday, December 8 from 1-4 p.m. When you think of Santa’s Workshop, you might picture a scene from a holiday movie with elves busy at work at a workbench, happily making toys for children. You won’t find Sant’s elves at Santa’s Workshop at Wilder Mansion. You will discover a special place where kids can buy gifts for others, such as teachers, family and friends. At Elmhurst Toyota, we appreciate this event because it’s fun for kids and teaches them the value of giving to others. The stately Wilder Mansion is always beautiful, but especially when decorated for the holidays. It provides a festive location for Santa’s Workshop. All the items for sale are inexpensively priced so kids can find just the right gifts for friends and loved ones. The holidays will be especially meaningful this year for children who give gifts from Santa’s Workshop that they selected and purchased themselves. Santa’s Workshop at Wilder Mansion is free to attend. You’re encouraged to donate a new, unwrapped toy to the Toys for Tots campaign. You’ll find collection bins inside Wilder Mansion. Donated toys will be distributed to the children of needy local families in mid- to late-December. 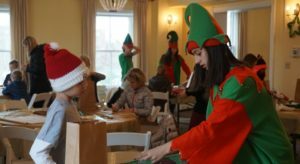 The holiday gifts for sale in Santa’s Workshop were donated by the Elmhurst Park District and generous local businesses and community organizations. Don’t let your children miss Santa’s Workshop at Wilder Mansion, a holiday store created just for them. It’s open between the hours of 1 and 4 p.m. on Saturday, December 8. December 8, 2018, 1-4 p.m.
Visit www.epd.org or call 630-933-8900.